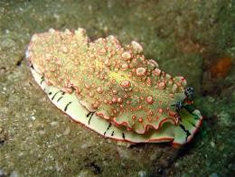 Around Phuket, we have many wonderful dives for all levels, protected bays for beginners, reefs with friendly sharks, colorful walls where you can find amazing critters and wrecks full of life. Your experience starts from the lobby of your hotel, you will be transferred to Chalong pier, south of the island, the major harbor for all the diving boats. Your day trip includes complementary breakfast and lunch served on board. Your equipment will be transferred to the boat leaving you free enjoy the day, at the end of which you will be transferred back to your hotel. 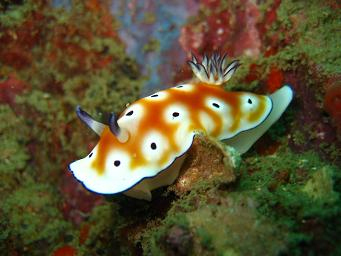 Racha Yai (or Raja Yai): Located 1½ hrs south of Phuket, Racha Yai island is the perfect place for beginners or divers in the need of a refreshing dive after a few years without diving. 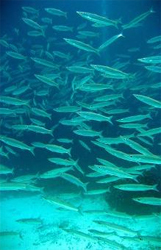 The several protected bays of the island give perfect conditions and an excellent visibility all year round. The shallow colorful reefs are inhabited by all kinds of tropical fishes: angel fish, parrot fish, surgeon fish, trigger fish, anemone fish, octopus, barracudas, blue spotted stingrays, giant moray eels, etc… Racha Yai is also a perfect destination for non divers wishing to do some snorkeling or just relaxing on the dive deck, enjoying the magnificent scenery. 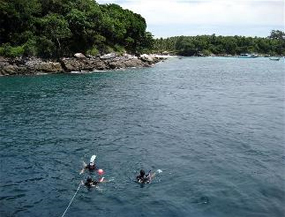 Racha Noi (or Raja Noi) : south of Racha Yai, Racha Noi island is where you can find amazing walls and slopping reefs, probably the most similar to the ones at the Similan Islands. 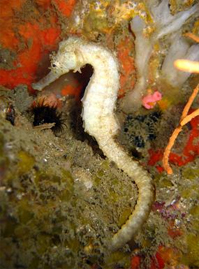 For experienced divers, the sites at the south tip of the island are the opportunity of a close encounter with some big pelagic species like manta rays and even whale shark. 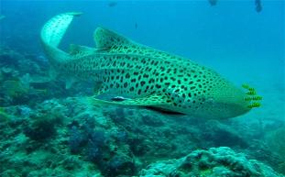 Shark Point : Well named, this reef located about 2hrs southeast of Phuket, half way to Phi Phi, is a marine sanctuary and home of the famous leopard shark, graceful and harmless. 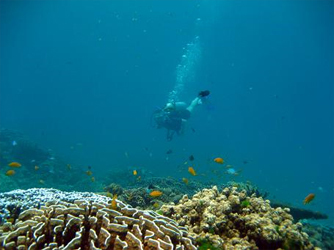 This reef, covered with gorgonian sea fans and colorful soft corals will leave you with some unforgettable memories. Anemone Reef : A few meters from Shark Point, this submerged reef is a garden covered with soft corals of all colors, red, pink, blue, purple and orange. 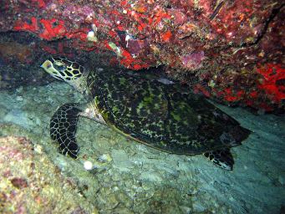 Leopard sharks and sea turtles are often spotted there. When there is no current, this site is probably one of the most beautiful of the area. King Cruiser Wreck : Sunk in 1997, this huge 85 meter ferry, going from Phi Phi to Phuket, is home of an incredible marine life. 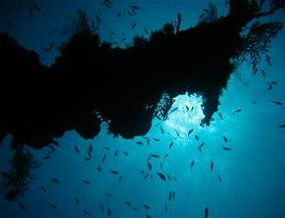 Resting at a depth of 30 meters on a sandy bottom, and damaged by the tsunami, this diving site is restricted to experienced divers. 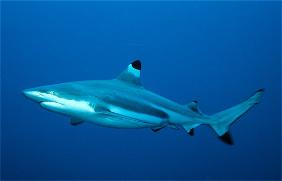 You will swim through huge schools of all kind of fishes surrounding the massive shape of the wreck. Koh Doc Mai : Half way between Phuket and Shark Point, Koh Doc Mai is a big rock with perpendicular cliffs falling in the sea. 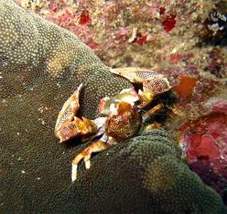 Here is a typical wall dive where life is everywhere. 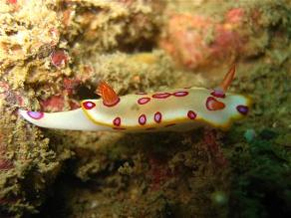 For macro lovers, this diving site is a dream with nudibranchs, sea horses, eels and shrimps. 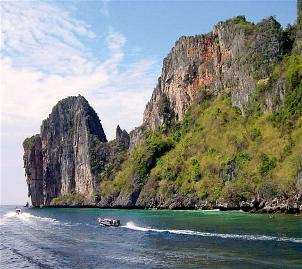 Phi Phi : Located southeast of Phuket, Phi Phi Islands are well known since the movie The Beach with Leonardo Di Caprio. 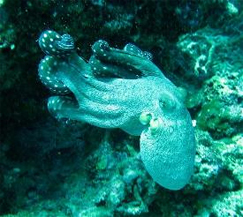 For divers, the best sites are the two rocks named Bidah Nai and Bidah Nok, where gorgonian sea fan, colorful corals, leopard sharks and black-tips sharks are competing with sea turtles, moray eels, nudibranchs and even sometimes whale sharks.